Life is slowly – r-e-a-l-l-y s-l-o-w-l-y – getting back to normal. Sort of. I think. I don’t normally make New Year’s resolutions, because I’m probably only going to break them, and that’s probably going to happen before the end of January. But as each new year rolls around, I do tend to think about goals and such. While recording DDOCast’s “Leveling” episode back in December, host Patrick asked what I was hoping to accomplish in the coming year. I hadn’t really thought about it, so I just went with the first thing that popped into my head and said that I wanted to work on soloing raids with Even. Well, after nursing a sick kitty back to health over New Year’s, I got to thinking about my goals for 2015, and it occurred to me that soloing more raids was kind of a dandy idea. And I wanted to solo more epic elite content as well. A solo romp through Tower of Despair convinced me that this could be a very fun plan indeed. With the changes to paladins, Even’s DPS is quite respectable. 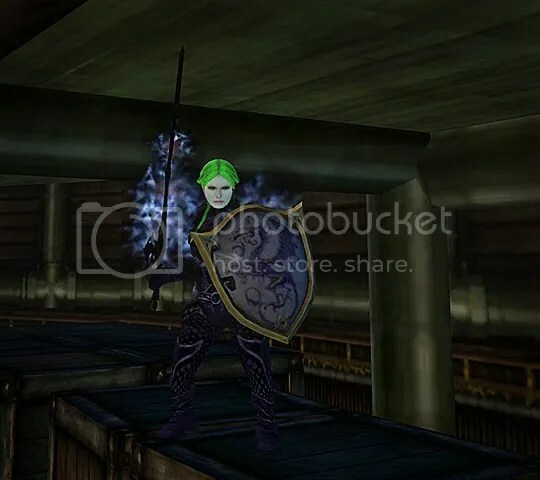 She doesn’t have the damage output of, say, a raging barbarian or a sorceror – nor should she, as combined with self-healing and damage reduction, that would make pallys WAAAAY overpowered – but she’s quite capable of beating down a self-healing raid boss (I’m talkin’ to YOU, Nythirios) in a pleasingly short amount of time. From what I’ve heard from friends who do a lot of soloing tougher content, I have kind of a different approach. Aside from ship buffs (which, granted, are pretty darn awesome, because thanks to having fantabulous people in our little guild, we have a Kraken with every available buff, AND I painted the whole thing green), Even uses Stalwart Pact, Holy Sword, and Death Ward pretty much all the time. She’ll use Divine Favor or Prayer, and sometimes Angelskin, for tough fights when I remember to cast them, and since I’ve somehow neglected to ever get her a True Seeing item, she carries TS scrolls. And that’s pretty much it. She has pots or scrolls for things like curses and poison and negative levels, and I try to make sure she’s got a couple of mana pots if she has Consecration twisted. 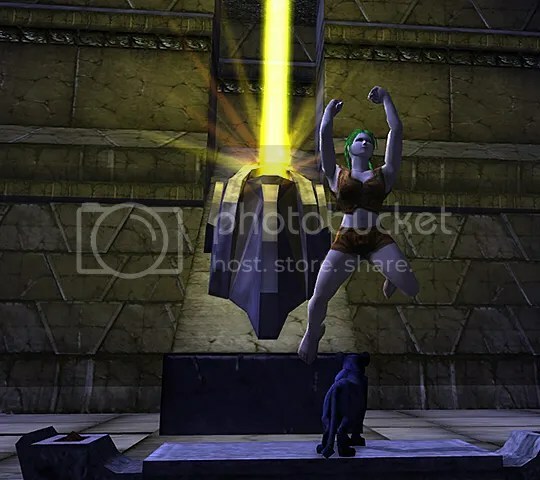 Almost nothing that can’t be bought from the House K guild vendors, and definitely nothing purchased from the DDO store – I want to PLAY my way to a completion, not BUY it. For the same reason, I probably take longer than my friends who solo similar content, because I stop and fight everything rather than invising or running through and letting mobs rubberband. So after ToD, I decided to start small, with a run of Vision of Destruction on normal. Well, that was pretty laughable – Even needed no healing AT ALL. I’m not sure she took any damage; if she did, the total was in single digits. She actually had more hit points when she was done than when she started thanks to temp HP from her stance. Elite VoD a few nights later went nearly as well; I decided to Cocoon her every time she dropped below 1,000 HP, and five Cocoons were all she needed. Actually the most impressive part was that I ACTUALLY FOUND VoD. TWICE. IN THE SAME WEEK. EH Chrono was a blast. Shroud – not so much. She got maybe six or seven portals down when I got a message that a portal keeper had shown up. I ran around to every single stupid portal and couldn’t find him. Took another lap – still couldn’t find him. So of course everything went coterminous and Even got unceremoniously booted. EH Against the Demon Queen was a walk in the park until the end fight, when I realized that you have to range the Marilith before she’ll come down. Even’s ranged DPS is… uh… possibly worse than old-style pally melee DPS, particularly since all she had was a non-epic Bow of the Silver Flame. On the first try, she ended up running out of arrows. So I made her a nice thunder-forged throwing axe, got a stack of TS scrolls (since the Marilith likes to cast displacement), and sallied forth again. That did the trick, and I pulled some decent scrolls and shards. Now that she has that throwing axe, I need to take another stab at Fall of Truth. I really didn’t think she’d be able to handle that, but other than needing three tries to take down the first pair and two to take down the second, it went REALLY well… until it was time to shoot the crystal and all she had was that non-epic Silver Flame bow. Yeah. I don’t think an entire inventory of full quivers would be enough arrows for her to manage that solo. Hopefully the much higher DPS on the axe will make the difference. I think I may try Fire on Thunder Peak next. I haven’t tried Tempest’s Spine because I know I’ll get lost; same reason I haven’t tried Caught in the Web, and – because of the path to get there – Temple of the Deathwyrm. Definitely not feeling ready for Mark of Death; don’t like Abbot enough to try that; don’t have a solo strategy I like for either one. Also haven’t been able to come up with any decent ideas for soloing Hound of Xoriat. I should give Reaver’s Fate a try, though. 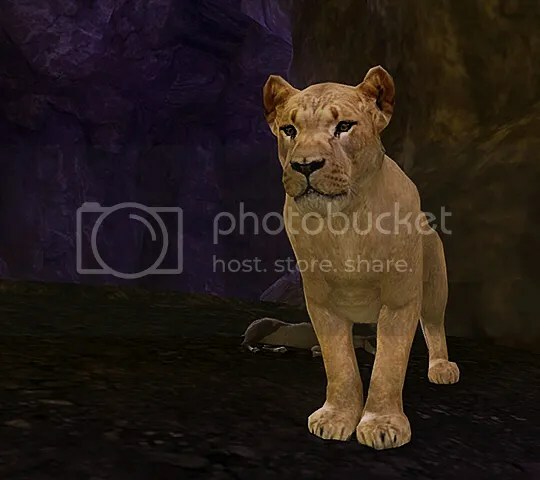 EH in almost anything is pretty much a walk in the park for Even, so she’s been trying to solo a lot more EEs and also join more EE PuGs… or she WAS, until I found out that NEW COSMETIC PET AND IT’S A LION CUB! Yeah. Challenging oneself is noble and good, but it can’t compare to A NEW COSMETIC PET THAT’S A LION CUB! So I’ve been doing more remnant farming than EE running this week. She did combine the two with a solo run of EE Devil Assault the other night; only got ONE champion who dropped remnants, but he dropped 36 of ’em. He must’ve been pretty high-ranking – the most remnants she got from a single mob in EE Mask of Deception tonight was six, and in several farming runs of EH Vol, she’s never seen more than four drop from a single mob (nor has she seen the Mythic Emerald Gaze she so desperately wants). BTW, that screenie is actually a mountain lion in the Storm Horns. I don’t have nearly enough remnants for the pet yet, nor have I seen anyone else running around with one so far. But I’ve kinda fallen off the face of WordPress and many other online places I (used to?) frequent. Real life can be pesky. It started in October, when I got hit with a string of the most freakin’-est WORST migraines I’ve ever had. I get migraines on a regular basis, stemming from a concussion I got in an auto accident. But my usual ones last half an hour, maybe 45 minutes, and I only get them a few times a week. These new ones are WICKED. Neck pain worse than a toothache, ringing in my ears so bad it feels like my head is vibrating… and for more than three weeks the best it got was letting up for an hour or two at a time before kicking back in. Don’t know what caused them, don’t know what made them mostly stop, still get one every so often but at least it’s not constant any more. So I started November by immediately falling behind the pace I wanted to maintain for National Novel Writing Month. Played catch-up for a bit, managed to get on track about two-thirds of the way through and then went into Super Amazing Word Churning Out Mode and ended up with more than 83K words, which netted me a personal best, my fourth straight NaNoWriMo win, and the trophy for the highest word count in my region. Meanwhile our cat Minni (a totally mis-named 20-pound male) had been diagnosed with a heart condition that caused blood clots to form in his heart and get lodged near his hind legs. He was only five years old and had a couple of bad episodes during October and November, but had bounced back amazingly well… until we got up the Saturday before Christmas and found him lying in the sunroom unable to walk. The vet put him on new medication and gave him an IV, but this time was too much, and we lost him three days before Christmas. That was MORE than hard enough to deal with, and we’re going to be dealing with it for a while – Minni was a very special little guy. Then Monday morning, four days ago, I got up and found Victoria, my 12-year-old best feline friend, was very lethargic and showing no interest in food at all. She’d been hungry as anything throughout the holidays, so I was hoping she’d just overindulged on turkey. The vet diagnosed a severe sinus infection. She’s prone to those, as she has chronic nasal allergies, but she’d shown no symptoms and her nose was still clear, so I was kind of wondering if the vet just came up with that because she’s had them so often… but by Tuesday morning her nose was completely clogged. She kept going downhill, to the point where I didn’t know if she’d make it through Tuesday night. She did, but barely, and the vet couldn’t see her until 11 am Wednesday morning; I just sat holding her and hoping she could hang on that long. Got her to the vet, where she got fluids and vitamins (she kept barfing up her antibiotic and was very dehydrated), and found out that my normally nine-pound cat had lost six-tenths of a pound in a day and a half. I’ve been mostly holed up in the spare room (because it’s by far the warmest room upstairs) with her since Monday night. Haven’t even turned the computer on (thank heaven for the tablet) since I signed off DDO Sunday night, probably haven’t gotten eight hours of sleep in the past four nights combined, because she’s been in REALLY rough shape and I’ve been giving her fluids every hour, 24/7. For the past four days, she’s been throwing up, barely moving, barely breathing most of the time, and hasn’t been eating or drinking on her own. Several times I’ve picked her up and said my goodbyes because I didn’t see how she could last even a few more minutes… but this morning she got up, went to her dish, looked at me expectantly, and meowed… and though it wasn’t much, she ate some of the food I gave her. Then she ate a little plain yogurt and had a nice long drink from her water bowl. She just seemed to keep getting better and better throughout the day. I’d gotten her and Callie some cans of their favorite gourmet cat food for Christmas, and I gave her some of that about an hour or so ago… she devoured it and then curled up with me and started purring like crazy. I was going to spend the night in my own room and maybe even fire up the computer for a bit since she was feeling better, but she wants to be in here and she wants me with her. DDO can wait. I fully intend to get back to blogging, and I’m definitely not abandoning OurDDO or Players Helping Players, just have a lot of other stuff that’s higher priority for me right now. Hopefully things will settle down in 2015!